18. At the core of Earthbound is its creator Shigesato Itoi, an adman who rose to the height of Japanese fame and entrances a wide audience of fans. Baumann posits that it is perhaps Itoi’s use of relatable material such as absentee fathers, gangs, and power corrupt police that makeEarthbound such a success. Quincy Rhoads lives in Clarksville, TN with his wife and their son. His writing has appeared inThought Catalog, Everyday Genius, and Unicorn Knife Fight. He teaches English composition and introductory literature courses. This is a sensation that occurs more and more as you enter the book’s later pages: Riippi simplyhas no fear of how he will be perceived. Perhaps the most recurring image in Because is the narrator’s grandfather pounding a nail into a cedar tree with his bare hand. 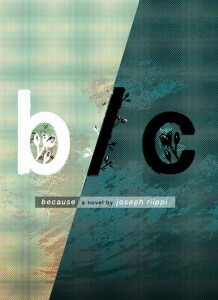 It is a fitting metaphor for the work Joseph Riippi has done with this book. It hurts, a lot, to read something so raw, composed with few tools besides human desire. But once you have finished—once the proverbial nail is in the tree—it is even more difficult to get it back out, to forget a book as open and rending as this. 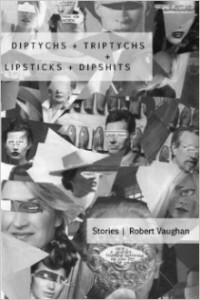 Diptychs + Triptychs + Lipsticks + Dipshits by Robert Vaughan was a bit of a puzzle for me at first. I’ve read a couple short pieces by Vaughan before, but I’m still fairly new to his work. Those who know him well as a senior flash fiction editor at JMWW or Lost in Thought and/or as the author of the chapbook Microtones (his first full length book, Addicts and Basements, is forthcoming in February 2014) might be slightly more prepared to know what they were holding in their hands. As for me, I just felt my way along and pondered. I heard some people describe Diptychs + Triptychs + Lipsticks + Dipshits as micro fiction, though others described it as a mixture of micro fiction and poetry. I’m hesitant to go with either description because I just don’t think it’s that clear. a perfect fuckhead. He’s seeing three other women (all named for European cities, like Sofia) and lies to them all. He’s also a sodomizer, and fronts a band that gets five or ten people to a gig. So, he’s getting fucked, too. JOE figures we all are. Rounding things out, the “Third Act” tells us that “JOE uses the restroom, never returns” and “LIS catches a Cubs pop fly in her gaping mouth,” causing her suffocate. This is a drastic simplification of the piece, but what it shows certainly doesn’t have the same feel or proceed about things in the same way that I’ve seen in the usual micro fiction I know. What the hell kind of a name is Penfield? She wonders while he takes a leak off the back porch. She leans to se fresh bruises in the dawn’s early light. She rolls too far, ends up on the bamboo-planked floor, giggling. Creepy-crawls under the bed to dial 911 on her mobile phone. However, though having poetic elements, the works in Diptychs + Triptychs + Lipsticks + Dipshitsalso don’t exactly remind me that much of most poetry I’ve seen. I’m certainly not a poetry expert by any means. I read somewhere around twenty or thirty books of poetry a year, which I think is more than average but not as much as a serious devotee. Regardless, consider “PART OF LIFE: TWO WAYS.” Sections of this work contrast a child’s view of her dad when her teacher releases a “deformed creature” with that of her mother’s view of the same event. In “Dad” we have: “Part of life, I heard Dad say for the millionth time. Just like mom’s lymphoma.” However, “Mom” relates: “The creature didn’t stir, not a peep. I started to salivate. Would it taste better with cumin or cardamom?” Poem? I’m not sure. I mean, “Dad” is structured in lines perhaps like a poem, but “Mom” is a solid paragraph. Is it a poem mixing stanzas and prose poetry? Is “Mom” just a single long stanza asymmetrical to the pretty much one-line stanzas of “Dad?” As I mentioned, I’m not a poetry expert. Regardless, it seems to me to have an interesting structure when I look at it as a poem. I got stuck in a cul-de-sac. The first thing I lost was my glasses, so everything was a smudge, blurred together like rotten trash. In the first house on the circle, a woman was playing Chopin. Her left hand crossed over her right during the allegro section and she nodded with her head to sit down. But I chose her kitchen hoping to find some butterscotcheroos or chex mix, or a ripe avocado at the very least. Came up empty. The next house was topsy turvey: too messy; the third I shipped because if you can’t leave your lights on for wayfarers, then you deserve to be ignored. The fourth house, a Colonial, had a nice built-in pool around back, so I took a quick dip, swam a few laps before I’d realized I’d swam under the foundation and was in a basement dungeon. I fled up the stairs but the door was locked. It took me forever to get out of that place with my bare hands. I realize that I’ve spent the vast majority of this review just trying to pin down exactly whatDiptychs + Triptychs + Lipsticks + Dipshits is. Perhaps it doesn’t really matter as long as one digs the pieces, which I do. However, when writing is this adventurous in form, I don’t think you can adequately consider it without looking a great deal at the form. I can’t help it; the form of the pieces fascinates. Personally, I would classify Diptychs + Triptychs + Lipsticks + Dipshits as something that is challenging to define but gratifying to experience. There are certainly leaps and turns that by themselves make the book worth looking at for their wildness. It may not take a long time to sit down and read, but that one sitting is by no means the end of a reader’s engagement. Echoes linger long after the actual sound that caused them is gone. David S. Atkinson is the author of “Bones Buried in the Dirt and the forthcoming “The Garden of Good and Evil Pancakes” (EAB Publishing, spring 2014). 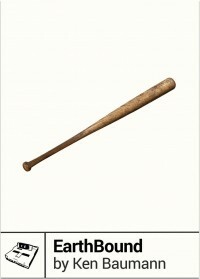 His writing appears in “Bartleby Snopes,” “Grey Sparrow Journal,” “Interrobang?! Magazine,” “Atticus Review,” and others. His writing website is http://davidsatkinsonwriting.com/ and he spends his non-literary time working as a patent attorney in Denver.